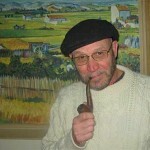 Pipeshoppe.com is the home of Penn Valley Pipeshoppe, online since 1998 serving the needs of sophisticated pipe smokers. Clay pipes are our specialty. If you are new to Pipeshoppe.com, we have been around the Internet since 1998. We sell a variety of pipes and accessories for the sophisticated pipe smoker, but with an eye to keeping the price of pipe collecting within the budget of as many pipe enthusiasts as possible. Our goals are to encourage pipe smoking to a new generation who may not yet be acquainted with the pleasures of the pipe and also to offer the experienced pipe smoker some interesting pipes that may have hitherto gone unnoticed. To that end we have specialized in selling clay pipes, which have seen a resurgence of interest over the past several years. Whether you are an avid pipe smoker, a curious newcomer to pipe smoking, a participant in period reenactments, a collector of well made pipe craft, or a casual site visitor, we at Pipeshoppe.com hope you enjoy your visit here and find some pipes to your liking. 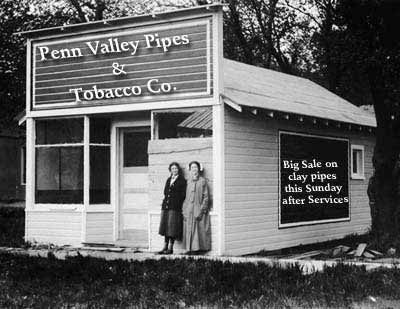 Penn Valley Pipes & Tobacco Company was founded in 1998 and run out of a small database program on an IBM desktop. After only a few short years in business we were able to move to our now famous “New Location” (pictured below) in rural Penn Valley just off the Main Line west of Philadelphia. Without electricity to the shop it was difficult to maintain our online operation and in 2003 we closed up shop temporarily while we searched for an even more remote location. Our search took us to a tiny hamlet in Upstate New York where 50 years ago crime bosses held an ill-fated conclave in hope of establishing order within organized crime. The gathering was raided before it could begin leaving a deep cultural and historic gap in the town of Apalachin; a void which Penn Valley Pipes & Tobacco Co. rushed to fill. With our storefront firmly planted on solid dirt and an 80 foot well pumping precious fluids into our facility, we only needed the electricity we lacked in Penn Valley in order to get up and running. As luck would have it one of the neighbors was hooked up to the grid and when they were away at work one day our assistant shimmied up the utility pole and tapped into their transformer. We were back in business!